One of the things that strikes you in Cambodia is the lack of any social services. Thus, it is very common to be approached by beggars missing various limbs or even their eyesight. Indeed, it is so common that since experiencing Cambodia I have been totally impervious to other countries beggars; none could reach the suffering of these poor souls. There was something in the eyes, something in the nervousness of Cambodians that was not quite clear. They are a charming, excellent people, but I felt some mental anguish was locked into their souls. In such a case, Cesca and I, cannot simply play the “tourist” and ignore it; we wanted to understand it. So, after checking out of our amazing Christmas Day hotel, we went back to normal levels of accommodation across the river and away from the main tourist areas. The Babel Guest house, Siem Reap turned out to be the very best room I had in the whole of South East Asia. A very well appointed, large room, with a comfortable bed was only the start. The building was constructed in an elegant, modern style, and more than welcoming. On our first day there we had much blogging and work to do and so headed down the Singing Tree, which was something of a travellers institution. There we enjoyed free WIFI, great food and drink while we caught up with things online such as the Credit card bills. 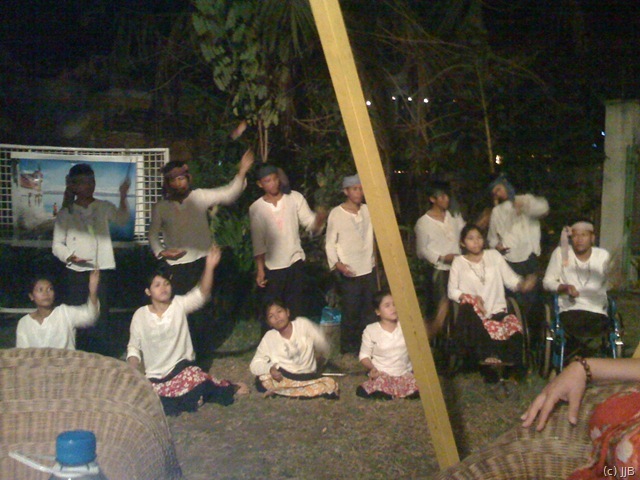 As the night fell the cafe regularly put on a show and today’s performance was by a disabled acting troop. The story was about an aspect of their suffering I had not yet considered. Sure, the government leaves them to themselves, but I had not realised that loosing a limb, or being naturally disabled, carried a massive social stigma here. The play ended and I had one of those moments one often gets in the cinema – when you suddenly snap out of the movie and become aware of all the people around you. I was suddenly aware of where I was, that all around me rich tourists sat and watched these unfortunates’ act. I was struck by the disparity between the two groups and my place firmly in the richer. After watching this play I could on longer simply be another blind tourist. I needed to understand this country and this set the tone for the rest of our journey. Our first step was to visit the famous Siem Reap night market, which has a small cinema showing a film about Cambodia and its recent history. We were very early and so sat at a local open air bar and chatted to the barman who taught us a few very cool bar tricks. Then we entered the cinema, which was really a projector mounted in a dark room made of metal sheets. The film was a simple homemade documentary, obviously a labour of love for the creator, it was short and mostly a collection of news clips with PowerPoint text over the top. Its message, however, was unmistakable. It spoke about the Khmer Rouge. The Khmer Rouge took control of the country after two main events gave their insurgency/armed-revolution enough popular support to win the war. The first was the disposing of the king Sihanouk and his exile to China. From there he was impressed by the Mao revolution and aligned himself with the Khmer Rouge. 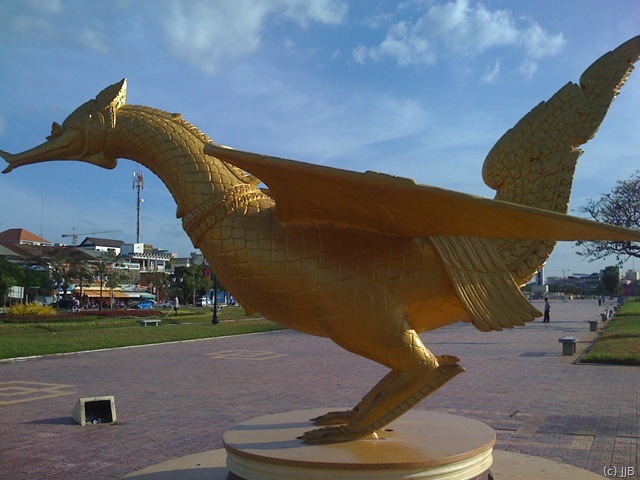 This led to many people supporting the communists in order, they thought, to restore Sihanouk. However, this was something that Pol Pot had no intention of letting happen. The second event was the American carpet bombing of Cambodian sites, mainly villages. 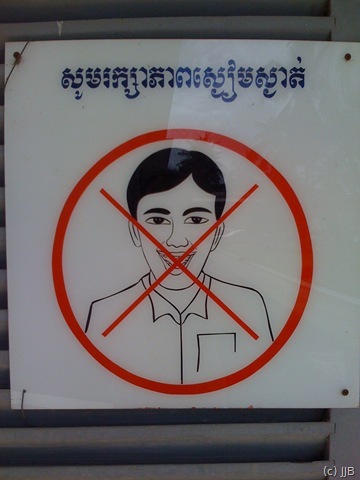 This led to a massive anti-American feeling that played straight into the hands of the Khmer Rouge. Eventually they won the war and gained power, but then what they did with it shocked the world. 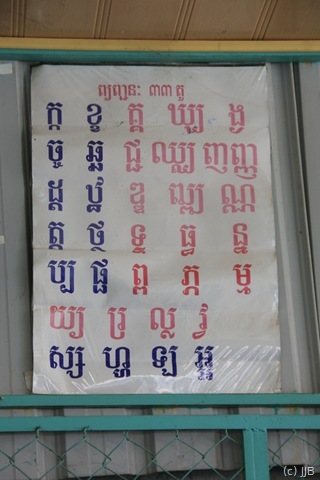 In power, the Khmer Rouge carried out a radical program that included isolating the country from foreign influence, closing schools, hospitals and factories, abolishing banking, finance and currency, outlawing all religions, confiscating all private property and relocating people from urban areas to collective farms where forced labour was widespread. The purpose of this policy was to turn Cambodians into “Old People” through agricultural labour. These actions resulted in massive deaths through executions, work exhaustion, illness, and starvation. Anyone who argued, spoke up, looked smart, or even had nostalgic feelings for the old regime was murdered. Eventually, when city folk displayed a singular lack of ability at farming, Pol Pot started murdering people who were committing “economic sabotage” by not meeting the quotas he set. This murder claimed the lives of 1.7 million people. Either by working them to death in the fields, shooting them for minor crimes in the camps or taking them to the centre of horror – S21 and torturing them mercilessly before taking them out to the killing fields and bashing their heads in. 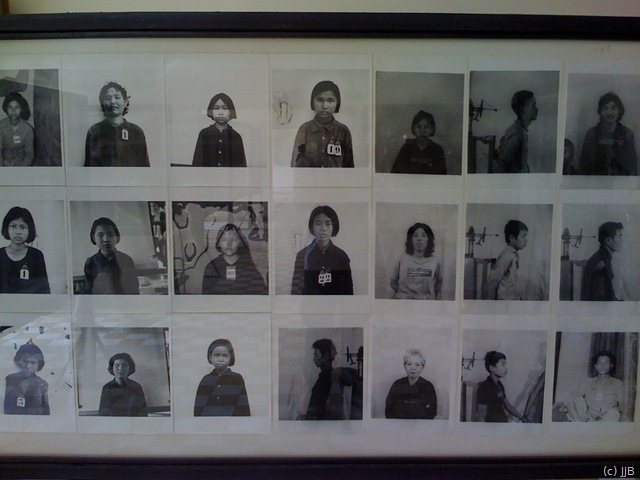 Anyone over 35 in Cambodia has survived the Khmer Rouge, and it was this that we could see in their eyes. The film stopped and Cesca and I exchanged looks. That such things have happened to these charming people was almost beyond belief. The next day we caught another bus down to the south coast to be able to celebrate New Year’s Eve in style. We travelled along the north south road and the countryside was simply beautiful. Green palms and rice paddies; just like your imagination conjures up. Eventually we passed south of the capital and into the Sihanoukville region. 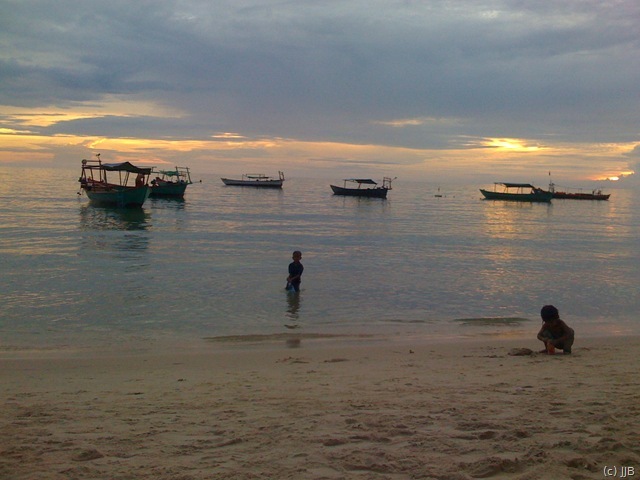 Arranged around a number of beaches, Sihanoukville is the holiday capital of the country. We aimed for the cheapest and most touristed beach of Serendipity. The Lonely Planet warned of dangers in that area, but we had little choice as we knew that rooms would be in short supply this close to the New Years. On arrival we found that rooms were actually in exceedingly short supply and we had to spend half a day hunting one down. We passed by many other couples trying the same thing, and most hotels simply laughed at us and said that we were the umpteenth couple trying for a room that day. 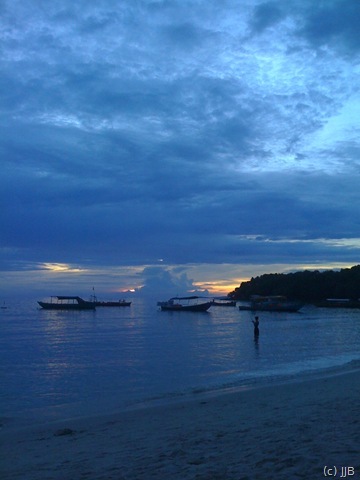 However, luck was with us and we found a room in a mainly Cambodian hotel right on Serendipity beach. We checked in and checked out the beach. A four mile strip of sand was entirely developed with seemingly endless cafe’s and bars all right next to each other. Not an inch of sand lacked a deckchair or table and we walked for only a short while before finding some sun loungers and relaxing with a cold coffee. This was the cue for the touts. Touting in Cambodian beaches is legendary, and mostly the remit of small groups of girls selling bracelets. Cesca purchased a number of these and had a great time chatting to the youngsters. In a little over a hour we had been touted and sold at by over fifty passing children and ladies. This, combined with the multitude of legless beggars miserably crawling across the sand, takes a special sort of person to overcome. You either just ignore them, or you feel terrible for ignoring them. Actually buying something or gifting a dollar to a beggar incites a veritable hoard of the afflicted to descend upon you. If this sounds like it was ruining the relaxation, it didn’t. All in all that day on the beach was a lot of fun. Cesca even talked me into having my back hairs pulled out by cotton. A technique that, in all my travels, has only been surpassed in pain by my one (and only) Thai massage. That night we prepared for the party. We were expecting a Western invasion of the beach, but in actual fact the Cambodians had got there first. All the Westerners were blockaded down one end of the beach by the absolute throng of Cambodian families having what must be a yearly picnic. I wish my childhood picnics had been like this one! 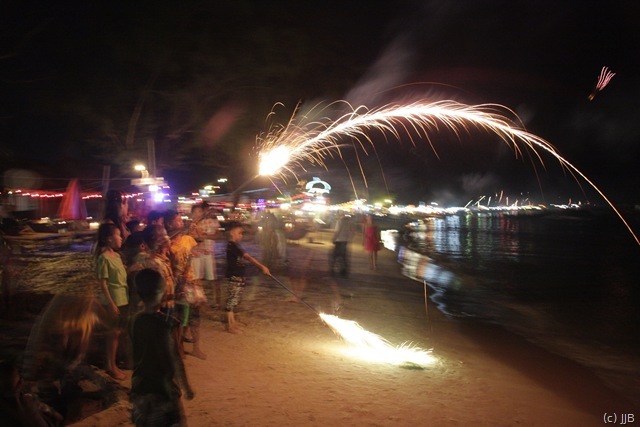 It seemed as if every single Cambodian man women and child, a number approaching 20 thousand easy, had a hand-held firework. 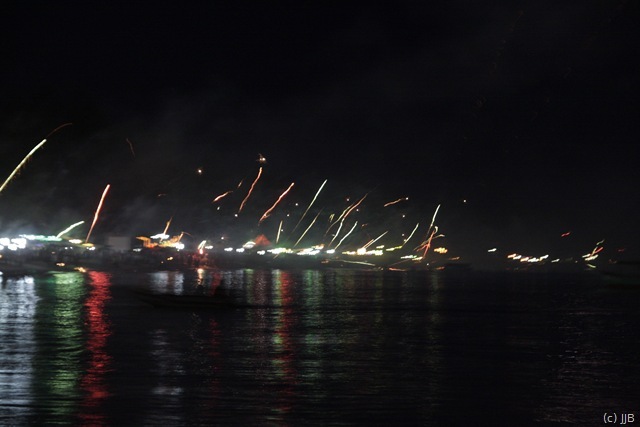 The night sky was aflame with bright coloured stars being shot into the sea in unimaginable numbers. It looked for all the world like Cambodia was trying to bring down some aircraft by barrage. I have never seen anything quite like it. The amount of fireworks is amazing (-ly dangerous)! 1) I am very tall and having to duck under all these fireworks. 2) Cambodian emergency rooms on New Years eve are probably packed already. After another rocket missed my face by inches, Cesca and I pulled back and reluctantly joined the Westerners in the tourist bars at one end of the beach. There we danced, drank and on the stroke of midnight went for a swim in the sea – it was one hell of a night, lit constantly by fireworks for the entire time. That was the end of 2008, one of the most interesting years I have spent on this planet. 2009 beckoned. A few days, and a few more hotels in quieter beach areas later, we left Sihanoukville for the capital Phnom Penh. 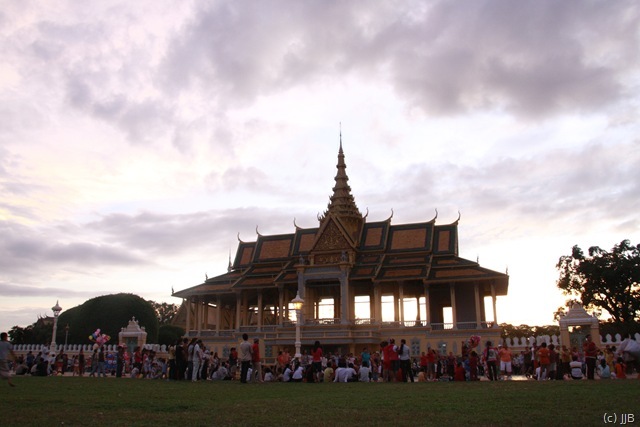 The capital of Cambodia has the most mixed history of the country. Host to the Khmer Rouge’s famous S-21 prison and torture facility, while at the same time containing some of the worlds greatest Buddhist monarchs’ palaces. We spent our first day in the city getting to know this history. WARNING If you don’t like hearing this horrible stuff skip ahead now. 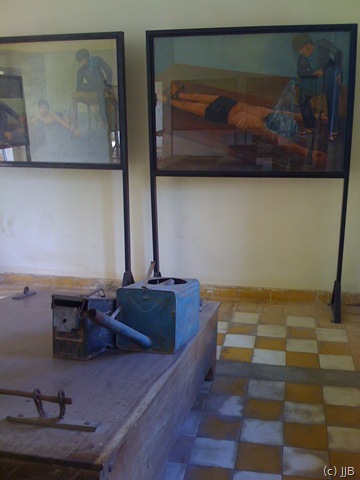 The torture room and some of the victims. I asked what it meant. He said that it was a sign telling the visitors not to laugh. I wondered how anyone could find this funny. He then introduced us to one of the very few survivors of the horror. This old man smiled and shook my hand. He was also a tour guide. I suppose that in coming here everyday he is excising his demons and indeed I saw no pain behind his eyes. After the guide left we went upstairs to the photo exhibition. This was a collection of images by a European journalist who had visited Cambodia under the Khmer Rouge. He had been a sympathiser for the Khmer and a communist himself. Under each photo was two little bits of text, one written at the time, and one written with the full weight of hindsight. It was not pretty. 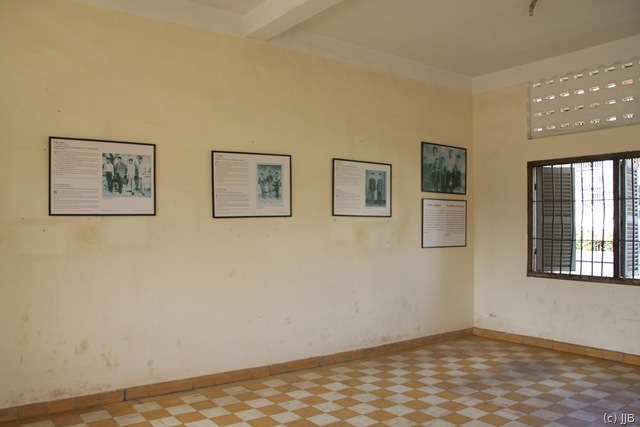 It was clear that the Khmer Rouge had stage managed his entire visit from start to end. I looked at the faces of the smiling Cambodians working in the fields. I remember thinking that most of these are now dead. It really brought it home to me. 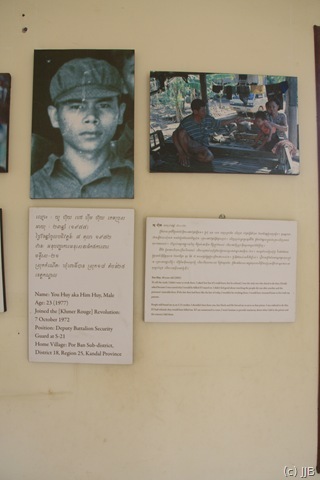 The next gallery was photos and text provided by families of those who went to war for the Khmer and helped run the country after their victory. This gallery spoke of the deeper truth in the story. 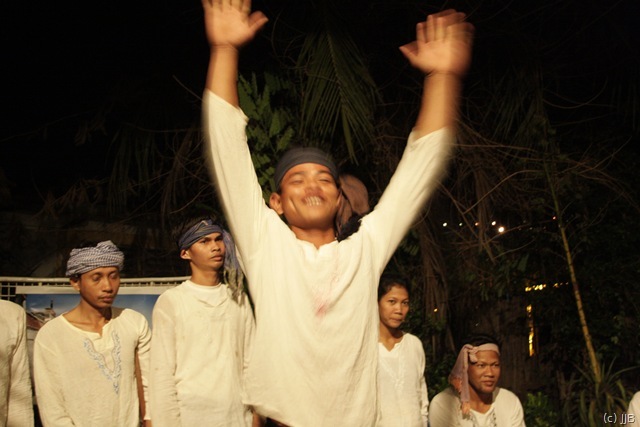 Many of the people worked for the Khmer gladly and thought the government a good thing. It was only the fact that most are missing presumed dead that spoke of a greater truth. How many Cambodians simply “got on with it” in small jobs? How many woke up to the what they were doing to their country? How many have yet to wake up? I left S-21 with a low heart and couldn’t face going to see the Killing Fields themselves, instead we decided to visit something positive. 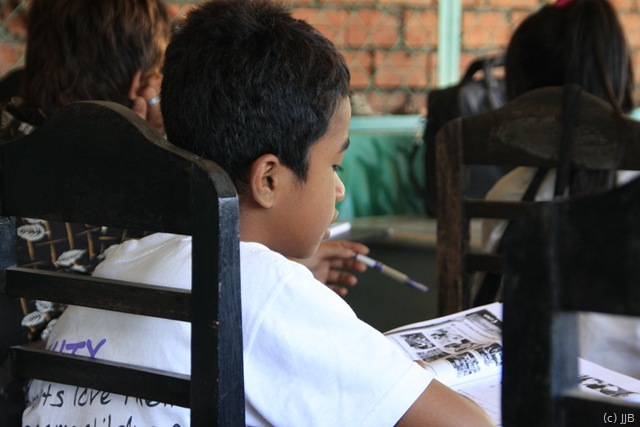 The New Cambodian Children’s Life Association (NCCLA) is an orphanage in the heart of the city. It was setup by a survivor of the Khmer Rouge who has dedicated his life and the profits of his two business to making a difference in the rebuilding of Cambodia. We got chatting to one of his managers when visiting Camory Foods, which is a bakery and cafe a short walk from the main bus stand. Cesca quickly got us invited to have a personal visit. We walked about half a mile along the strip, past multitudes of restaurants and cafe’s and then turned down a side street. Here we met many of the people involved; they were making the children’s lunches. Many hellos were exchanged and smiles and Cesca snapped off a few images, then we were led down a succession of increasingly grim alleyways. These were the sort of alleys that any normal person would avoid, especially in Cambodia, but we went anyway. At the end a non-descript staircase led up to the orphanage proper. Built over three levels the setup was a tight fit for all the inhabitants. At first you had the separate boys and girls dorms, then a classroom with three very old computers in it that led out onto a large oblong balcony overlooking the city. Above this we found another room with a class in progress. About twenty children were being taught English and we sat quietly at the back and were very impressed by the quality of teaching. After this another class started up, this one was teaching Japanese. We quietly left them to it. I have spent much time since trying to think of a way I may help more, and have come up with something a little special. I am going to make a series of high quality computer wallpapers and sell them on this website at $1 a set. Then all the money will go to these poor kids. We left the little hordes as they were piled into a small bus to take them to another lesson. I felt the entire experience had been one of hope and it quite made up for the history of S-21. This country needs to forget the past horrors and look to the future. Places like the NCCLA are doing just that.